Tim and Dawn Pexton were honored with the Wyoming Farm Bureau Federation Leadership Award presented by WyFB President Todd Fornstrom, right. 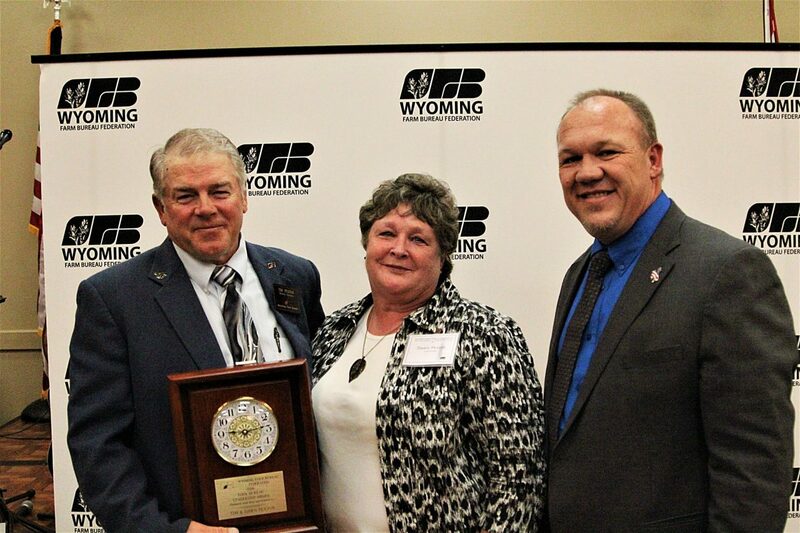 Tim and Dawn Pexton, of Converse County, were awarded the Wyoming Farm Bureau Federation Leadership Award at the organization’s 99th annual meeting. Presented Nov. 8, the award is given to those who have gone above and beyond in their agricultural leadership service in the organization. Serving in leadership roles to represent farmers and ranchers is part of Tim and Dawn’s agricultural life. And it isn’t about the title either … wherever there is a need for leadership is where you will find them. Advocating for farmers and ranchers of all ages to join Farm Bureau and be a part of the voice for agriculture through membership in Farm Bureau has been an important component of their leadership. Tim’s direct involvement began in the early 1970s. He and Dawn were married in 1979 and Dawn has attended nearly every annual meeting with Tim. Whether it be serving as county president or county membership secretary or serving as the co-pilot for one another on the long drives across the state to Farm Bureau meetings they are the epitome of leadership in Farm Bureau. Tim serves as the Central District Director on the Wyoming Farm Bureau Federation board of directors. 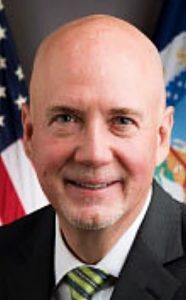 He also serves as the Wyoming Farm Bureau Membership Committee Chair; a position he has held for 20 plus years. His involvement in a Young Farmer Organization in his early years provided interaction and leadership opportunities including a couple of overseas trips to learn about agriculture in other countries. He has always been an avid supporter of Farm Bureau’s Young Farmer & Rancher program providing ideas and guidance. Tim’s love of Farm Bureau shows when he is mentoring new young members to get involved in the organization. Tim is a fourth generation rancher south of Douglas near Esterbrook. Their children are now married and have given Tim and Dawn four beautiful grandchildren with which they love to spend their time.